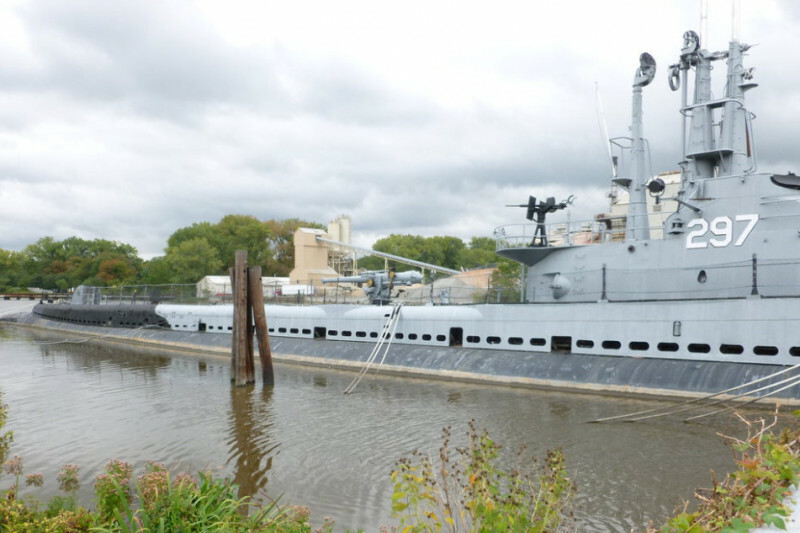 USS Ling (SS-297) has been a fixture in Hackensack, New Jersey since the early 1970s, when the U. S. Navy offered it to a group of local veterans for use as a floating museum. The nearly 2,500 ton, 312-foot long World War II-era vessel remains berthed along the shore of the Hackensack River and has served as a floating museum operated by a group of devoted veterans from the Submarine Memorial Association (a nonprofit organization) who have worked tirelessly for decades to keep the submarine's history alive. Mired in the muddy river bottom and damaged by Hurricane Sandy in 2012, Ling was forced to close for months in the aftermath of the storm. Following a massive cleanup effort Ling was finally able to reopen for tours, and the public returned enthusiastically and in large numbers. Unfortunately, the piling supports to the pier, already damaged by Hurricane Sandy, deteriorated to the point where the pier finally broke away in 2015. Inaccessible from shore as a result, Ling has been shut down ever since. USS Ling has hosted countless thousands of visitors over the years; now, without the income generated by admission fees and sales revenues from its small museum, the Submarine Memorial Association must rely exclusively on charitable contributions to fund even the most basic repairs, conduct preventive/corrective maintenance, or perform routine preservation and upkeep. The following article from the June 12, 2017 edition of the New York Times describes the potentially very bleak future for this important piece of US Naval history if nothing is done to save her. While many contend that USS Ling should be cut up and removed from the river in pieces, members of the Submarine Memorial Association disagree that the boat should be destroyed - in fact, they contend that Ling not only can be saved, but can and should be restored and preserved so that future generations can learn about the rich history of the US Navy Submarine Force and those who have sailed into harm's way beneath the ocean's depths. Saving USS Ling is imperative; our rich submarine heritage demands nothing less. The Submarine Memorial Association is a qualified 501(c)(3) organization. Please consider making a tax-deductible contribution today - and even if you choose not to make a donation, you can still help by sharing USS Ling’s story with family, friends and colleagues on Facebook and Twitter. Pride Runs Deep! For whose who consider the USS Ling little more than an eyesore or a sad relic, please take a moment to read the article in the link below. It is not only a poignant reflection, but serves as an important reminder of what she represents to our Nation and to our future generations. May God bless not only all who sailed in her, but all the members of "the Greatest Generation" who made the ultimate sacrifice during World War II -- particularly the brave men of the Silent Service who forever remain on Eternal Patrol. Who -- and, more importantly, why -- would anyone undertake such a cowardly and despicable act as this? For anyone wondering why this campaign is so near and dear to the hearts of so many, I invite you to copy the link below into your browser and meet 97 year-old WWII submarine veteran Joe Mongelli. From WCBS News Radio 880 in New York. Thanks to everyone for your valued feedback! I truly appreciate hearing your comments and am happy to answer any questions you have about the campaign. Remember, though: GoFundMe does not have a mechanism by which Campaign Organizers can respond to "Comments," so if you have questions, please send them via email instead (just click on the green envelope next to my name on the campaign's home page). I'll do my best to respond to all emails as quickly as possible!